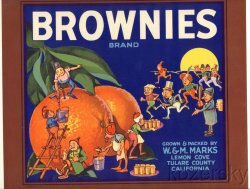 Original Brownies Brand Crate Label, W.& M. Marks, Lemon Cove, Tulare County, California." Original Brownies Brand Vintage Crate Label. "Grown and Packed By W.& M. Marks, Lemon Cove, Tulare County, California." Graphic image of Brownies draining juice from an orange. This mint old label from the 1930s measures 10"x11". Vibrant colors. Shipped flat in a sturdy envelope. Ready to frame.